Insignia proudly offers a wide variety of finishes to complete your project. Below is a sampling of those finishes, however if you need something you do not see please call to discuss how we can create a one-of-a-kind finish for you. 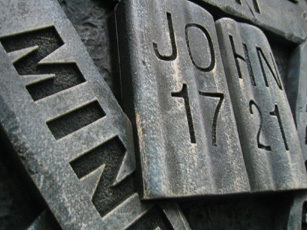 Faux Finishes: We can customize a faux finish to any texture or patina. 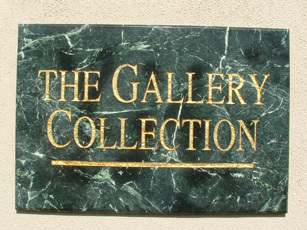 We can make signs look like granite, stone, rock, marble, sand, metal, wood, stucco and much more. 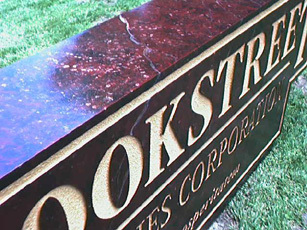 We can finish HDU "foam" to look like any of a variety of wood species (such as mahogany or walnut) and to emulate marble, granite and cast metals. 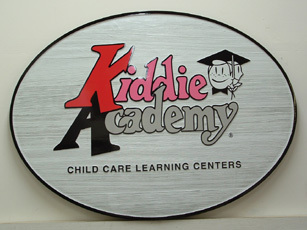 We are very skilled at making Medex look like a cast aluminum or bronze sign. Just imagine the possibilities with our faux finishing techniques. 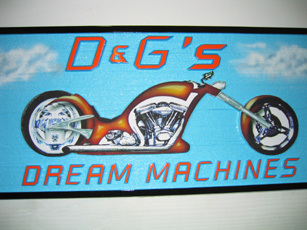 Computer Generated Vinyl Graphics (CGV), Vinyl Application & Specialty Vinyl: This includes creation of full color large format digital print on vinyl which can be applied to signage, reproduction of high detail artwork in high performance vinyl applied to signage and vinyl application to mimic frosted glass, brushed metal, reflective metal, marble and much more. 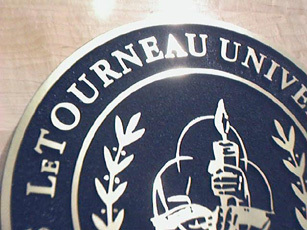 Metal Leafing: 23K real gold leaf, silver leaf, copper leaf and more can be applied to signage to improve its luster. Plant On Graphics, 3D Carvings and Appliques: Insignia can create custom works of art with signage with plant on acrylic, HDU, wood, rope or any 3-dimensional object. Additional Painting Techniques: We can utilize custom painting techniques, including airbrushing, hand painting and mask and painting. These techniques allow us to create fine detail, as well as keep your sign within a budget. 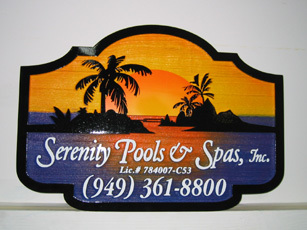 Custom painting techniques in your signage project allows for increased creativity. 1 Shot Paint is a fantastic sign painter's paint. Originally intended for sign writing on store fronts, vehicles and wherever fine lettering work is desired, 1 Shot Paint is widely known for superior hiding, durability, excellent resistance to sagging and a great choice for sandblasted and routed signs. In addition to the Lettering Enamel we also use the 1 Shot Pearlescent, Bulletin and Art & Sign Poster Colors. Lettering Enamels are oil-based superior quality high gloss enamels for interior and exterior use on metal, glass, wood, HDU, Masonite, MDO, Medex and other sign materials. Below is the 1 Shot Lettering Enamel Color Chart. We can mix other paint brands, pantone and color swatches using the Lettering Enamel to create a large variety of colors and looks. Matthews Paint manufactures the world's finest coatings for architectural signage. For over 70 years Matthews Paint has maintained demanding standards by using only the best chemistry available and is backed by years of field testing and research to assure the most ultraviolet and weather resistant coating systems on the market today. A coordinated palette of thousands of colors is designed to simplify and inspire designers in an easy-to-use color system. With a database of more than 40,000 formulas the color-matching abilities are unrivaled. Matthews Paint can match pantone and many paint companies (such as Benjamin Moore, Dunn Edwards, Sherwin Williams, Kelly Moore, Frazee, Behr, Glidden and more). Also, 1 Shot Paint can be mixed with Matthews Acrylic Paint and we have corporate name paint colors in stock, such as: McDonalds, Burger King and Best Western. Insignia has left its mark as an expert in sandblasting wood signs. 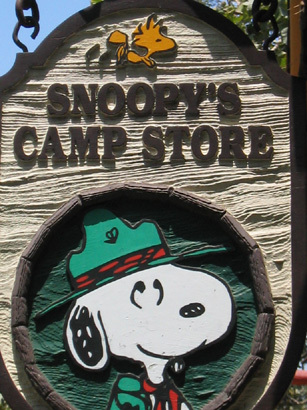 As an expert we have developed a pallette of standard "Redwood" stains and clear coats that are the best choice for your Cedar and Redwood Signs. These 3 stains and clear coats (shown below on cedar) are our most requested stains. Please keep in mind that "Natural Clear Coat" will look different from sign to sign and within a sign depending on the color of wood used. Wood is a natural living organism, created by God, not signmakers and must be viewed as such. We can tint, stain, dye and change the wood color, but we can not guarantee its final color. We highly recommend choosing from our three redwood choices for your sandblasted wood sign. Please also indicate whether you want light wood, dark wood or a combination of both. 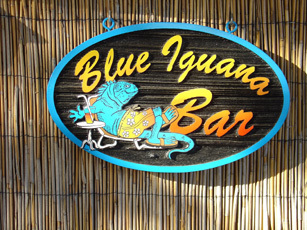 While our experience proves that the above stains and clear coats are the best choice for your sandblasted wood sign, Insignia can stain your wood signs using an array of other stains and clear coats. As we stated, wood is a natural living organism and must be viewed as such. While we can tint, stain, dye and change the wood color, we can not guarantee its final color. We find that these stains remain most true to color when used on woods other than Cedar and Redwood or with signs that are not sandblasted such as dimensional letters or backer board. The following chart is a sampling of the Minwax stains we use. If there is a color you would like, but do not see, please do not hestitate to ask your customer service representative about our full line of stains. Clear Coats and Anti-Graffiti Coats: We can put a UV coat, Anti-graffiti coat or seal coat on all signs to help protect against fading, protect color coated signage & vinyl graphics and highlight metal surfaces. We also have anti-graffiti coats that allow graffiti to be wiped right off. Note: Due to differences in monitor resolutions and color depth, it is impossible to view a perfect color match. These color examples are provided for reference only. The Pantone Color Guide was developed for the printing industry for use to color match printing inks. If you have a specific Pantone color in mind, we can match it, but can not guarantee 100% accuracy.